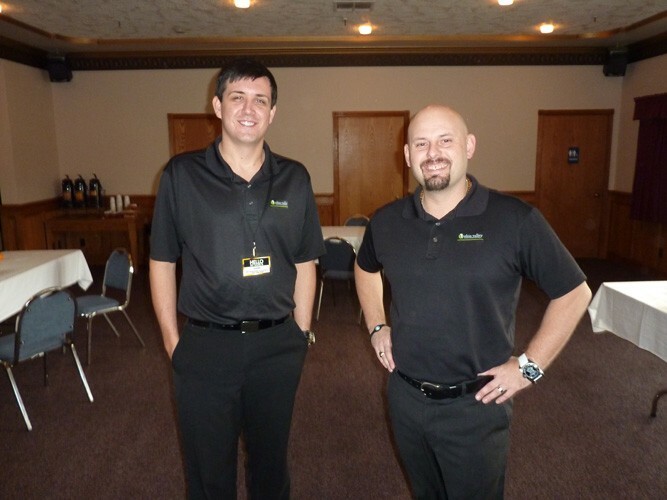 Ohio Valley Gold and Silver Refinery's Dustin Barton (left) and Nate Shaffer set up with most of their gear at the Best Western Bayshore Inn. Despite the advance hype, there wasn't much happening early Tuesday morning at the Best Western Bayshore Inn, down there by the Bayshore Mall. Dustin Barton and Nate Shaffer, the Ohio Valley Gold and Silver Refinery's men on the ground, were supposed to be energetically buying precious metals, old coins, watches, jewelry, guitars, war memorabilia and other curiosities right about now. Instead, they were milling about the empty conference room fiddling with paperwork or the gear set up at a couple of folding tables. The scales they use to weigh their customers' items had not yet shown up, and so Barton and Shaffer were in a holding pattern. A couple of other visitors had already dropped in -- inspectors from Humboldt County's Department of Agriculture, which is charged with making sure that all scales used for commercial transactions are on the up-and-up, and that the people operating them are properly licensed by the state of California. Since the scales hadn't shown up yet, there was little for them to do. But Jeff Dolf, Humboldt County's agricultural commissioner, said later that morning that there's been a lot of chatter amongst his peers about companies like Ohio Valley Gold and Silver Refinery -- itinerant purchasers of precious metals, which, in a down economy and with the prices of gold and silver at record highs, have blossomed all over the country. The growth of such firms has not always been smooth. Ohio Valley itself -- and its parent company, Treasure Hunters Roadshow -- has been accused of lowballing its customers and ripping off the trademark of the PBS program Antiques Roadshow in order to trade its good reputation. Last week's Journal carried a full-page advertisement announcing that Ohio Valley would be in town this week, and offered a taste of what would be on offer. "Just gather up all gold, silver and platinum in any form," it read. "The value of the items will be determined based on up-to-the-minute market prices ... If you choose to sell your items, they will be bagged and tagged and you will be escorted to the cashier to collect your payment." Because the company is a "refinery," the ad related, it can give you a better deal. But this claim is criticized in several news reports from across the nation, and in Antiques Roadshow's trademark lawsuit. Last year, the Texas Examiner, a paper out of Beaumont, surreptitiously brought several items to various Treasure Hunters Roadshow events. The prices offered at each event differed wildly, but were far below the items' actual value. The highest price offered for a collection of coins worth $1,440 was $640, apparently because the company was only considering the value of the metal the coins contained. The trademark lawsuit brought by PBS affiliate WGBH -- American licensee of the British "Antiques Roadshow" brand -- charges that the company is in the habit of "underpaying or undervaluing products" and "buying valuable antiques at pennies on the dollar." The lawsuit, which is still pending, charges that the company deliberately conflates itself with the well-known and beloved PBS program in order to deceive potential sellers. For his part, Shaffer -- the Ohio Valley supervisor on the ground in Eureka -- said that his company absolutely offers fair prices, often well above what any other buyer in the area offers. He hinted that some of the bad press the company has received may be motivated by the threat of outside competition. "I've had people walk in here saying, 'The pawn shop only offered me $25 for that,'" Shaffer said. "Well, I can offer a lot more." Ohio Valley's arrival in town occasioned reviews from several city and county agencies. On Tuesday morning, Jeff Dolf said that the company's certification from the state to weigh goods appeared to be in order, though one of the company representative on the ground had not yet been added to their list of certified weighmasters. Dolf added that scales used by Ohio Valley had to be on the list of state-approved devices for such transactions; since they had not yet been delivered, he could not yet say whether they conform. Meanwhile, current Eureka municipal code specifically requires dealers of "old gold and silver" to obtain a special "second-hand dealers" license from the city. The code requires such dealers to report details of every transaction made to the Eureka Police Department every day. But City Clerk Pam Powell said that the code is antiquated and has been superseded by state law. (In addition to gold and silver dealers, it also references traffickers in spurs, harnesses, ropes, whips and "patent toilets.") Powell said that she flagged the section for future cleanup in response to the Journal's inquiry, and also confirmed that the company did acquire a standard city business license. Ron Harpham, a detective with the Eureka Police Department, pointed out Tuesday that the corresponding section of state law -- Business and Professions Code Section 21626 et seq. -- specifically carves out an exception for second-hand dealers whose primary business involves old coins and precious metals. So while local pawn shops must, in fact, report their business transactions to the EPD daily -- primarily to combat trade in stolen goods -- Ohio Valley appears to be under no such obligation. Though the issue of the scales hadn't been settled by the time the Journal went to press, every other conceivable regulatory restriction on Ohio Valley's Eureka trading operations -- they'll be here through Saturday -- appears to have been handled. As for the prices, that's entirely the concern of the people who bring their old krugerrands and flatware to the Bayshore Inn, lured there by the promise of off-the-hook prices. As Harpham noted, offering crappy deals does not constitute a crime.